Last week I shared 5 tips for living in a “staged” home because, yes, we’re selling The Bold Abode! 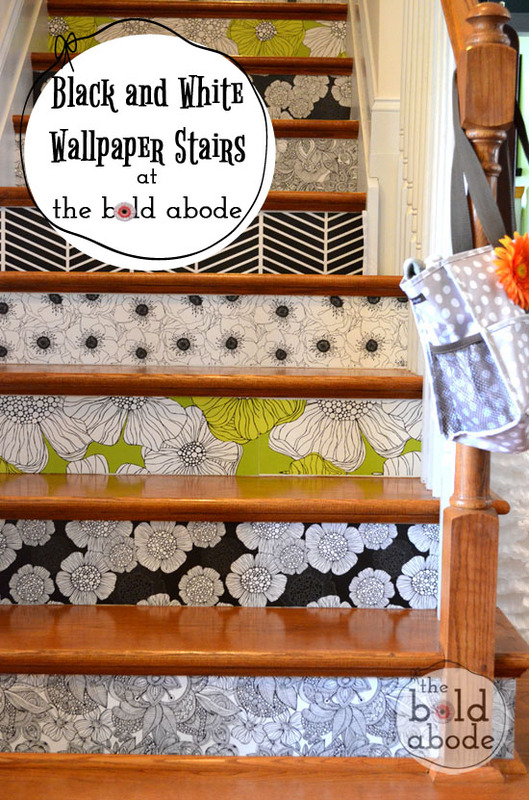 When the stagers came to take stock of TBA, I was reeeeeallly worried I’d have to paint every square inch and rip down all the updates that I’d previously made, like the dining room wallpaper, the sharpie wall, the stenciled bedroom wall and of course, the stairs! Thank the twinkly stars above, all I really needed to do was to paint the boys rooms back to the original color and touch up the chips and dings throughout the rest of the house. And clean. Clean like I was having the Queen of England over for some breakfast casserole and southern style biscuits. But let me back up. The stairs. 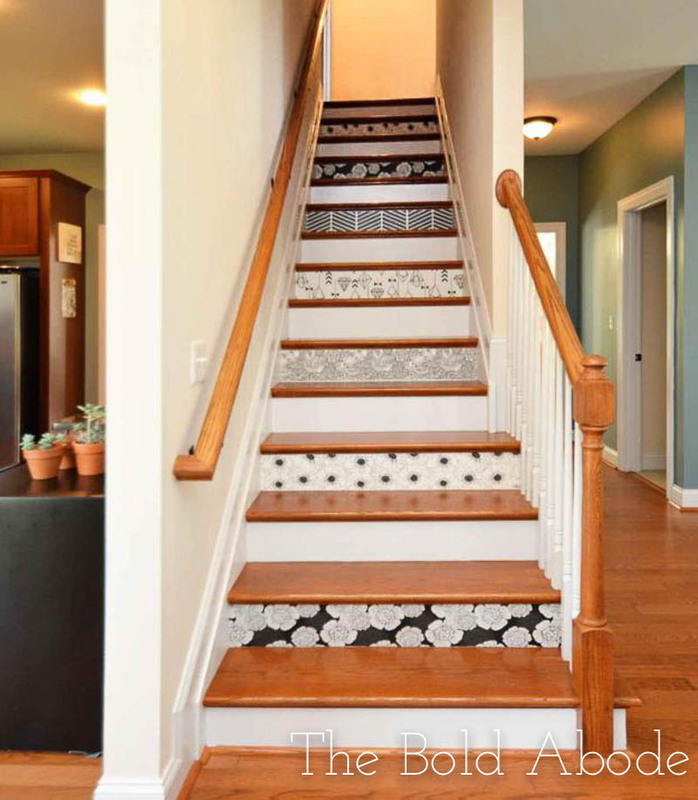 They loved the stairs but suggested I tone them down just a bit by removing the paper from every other stair, which I did and am pretty happy with. Living with them for several years warranted a change anyway, so I was happy to do it. As you can see, they were indeed quite busy. But I loved all the patterns and have to say, they are the most commented on project in my entire house. You’ll notice that the green is totally gone and it feels much lighter and brighter. I was able to keep at least one riser of each pattern of wallpaper and that made me very happy. I also gave each white riser a fresh coat of paint, so they really pop. It’s hard to believe such a small change can make such a big difference. Truth be told, I’ve never loved my home more than I do right now. Getting rid of all the clutter and junk and extra stuff that we really don’t need everyday makes for a beautiful place to live. And I’ve got several more photos of a very, very clean Bold Abode to share! I’ll be doing a full home tour for the first time ever very soon, so check back! Have you ever sold a home? What tips do you have for keeping it ready to show? Let me know down in the comments below! P.S. The wallpaper is from Spoonflower.com. 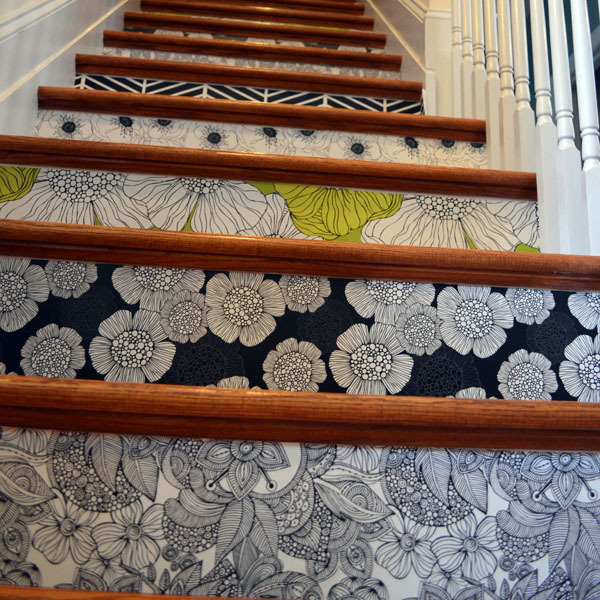 For more information, check out my original wallpaper stairs post here.